Plan the Perfect Croatia Road Trip With Our Detailed Guide! If you want to plan your perfect Croatia road trip, you’ve come to the right place! We love Croatia – and while we also recommend visiting the other Balkan countries, a Croatia road trip is never a bad idea. Planning a Croatia driving itinerary can be difficult because of a variety of factors. From tolls on highways to hidden gems you might drive through without realizing, there is not one way to plan a road trip. Another consideration is where you leave from and where you want to end your Croatia road trip. Leaving on a road trip from Zadar is going to look very different than if you leave from Zagreb. Croatia’s unique geography makes it important to know the differences between the regions and what you can see and do in each of them! 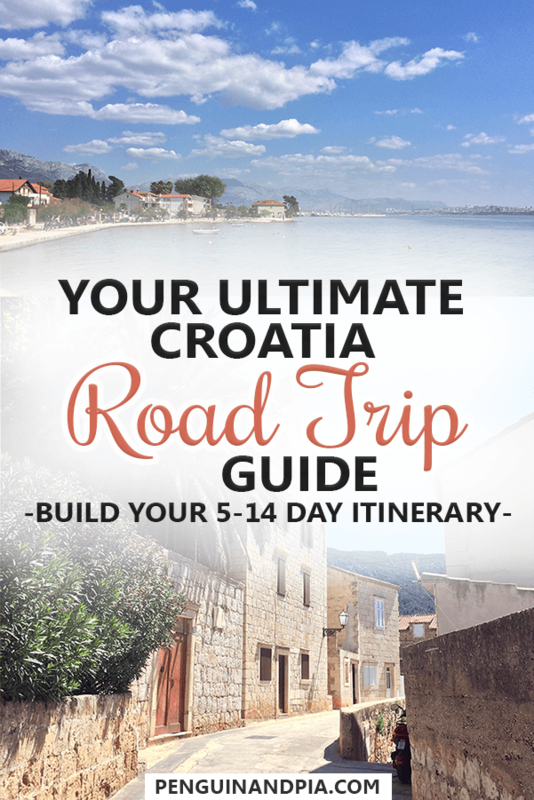 So, whether you’re planning on doing a 5 day Croatia road trip, a 7 day Croatia road trip, or an ultimate 14 day Croatia road trip, we’ve got you covered. There’s a lot you can discover on a Croatia road trip in 2 weeks! Consider this your Croatia road trip planner. Ready to get exploring? Let’s drive around sunny Croatia! Aside from deciding on the destinations you want to check out all over Croatia, there are lots of other factors and details you’ll need to think about before you head off on your big Croatia road trip. Generally, driving in Croatia shouldn’t be too difficult – especially if you are used to driving in other European countries. Many of the road signs are quite similar. In Croatia, people drive on the right side of the road – as is the case in most of Europe (minus the United Kingdom, Ireland and a few others). Distances are given in kilometres (not miles) and speed limits are given in kilometres per hour. The speed limit for roads within cities is usually 50 kilometres per hour, 90 km/hr for rural roads and 130 km/hr on the motorways. However, always follow the specific signage and speed limits specified where you are driving! To be able to drive a car in Croatia, you must be over the age of 18. Of course, you also need a valid drivers licence. If you are from outside of the European Union you might need a valid international drivers licence in addition to your normal licence. Please double check before departure with your transportation board/agency. If you’re renting a car, the age restrictions of the car company might be different so keep this in mind, too. Renting a car in Croatia should be pretty straight forward as this is a pretty normal scenario for visitors spending time in the country. However, depending on where you are driving, you should check whether you are allowed to take the car across international borders. If you’ve read any of our Croatia transportation posts you might be aware that north of Dubrovnik there is a tiny part of Bosnia and Herzegovina that reaches the coast and thus separates Croatia into two parts. If you’re driving from the north to the south of Croatia you, therefore, have to cross the Bosnian border. We will get into the details of this border crossing if/when they affect the itineraries below, so don’t worry just yet! While generally, rental car drivers don’t experience any problems, you should double check with your agency about the rules of changing countries. This is even more important if you consider taking a day trip to Mostar in Bosnia & Herzegovina or Montenegro (which we would absolutely recommend if you have the time). In both those cases, you would be crossing EU outer borders so you have to check with your rental agency whether this is allowed! You can compare rental car prices with this handy tool. If you are driving on the motorway, you will have to pay tolls. During our month in Croatia, we never used the motorway so we can’t give you any specific details about our experience. However, if you only have a limited amount of time and want to get from one place to another quickly, you might decide to use them instead. The A1 from Zagreb to Dubrovnik is probably the main toll road in the country. While there is an option for electronic toll collection, this is probably not the best option if you are only in Croatia for a few weeks on holiday. You will most likely just pay the toll at toll gates that you pass through. That said, make sure you have enough Croatian Kuna with you. In most cases, you can also pay with credit card and sometimes Euro. During our time in Croatia, we stayed in a few apartmani. This is just the local word for an apartment. We like to have our own space and cook our own meals when we stay in a place for more than just a few days. That said, when doing a road trip you’ll have lots more options for places to stay since you can drive to places high up on the coast (with the best views). You won’t have to rely on staying only in the city centre or on bus routes to get you around/home. This was very close to where we stayed for 5 weeks outside of Split! For charming old towns – Check for Hotels and Apartment Deals in Dubrovnik. For easy island hopping – Check for Hotels and Apartment Deals in Split. For discovering the capital city- Check for Hotels and Apartment Deals in Zagreb. For seaside vibes- Check for Hotels and Apartment Deals in Pula. For Roman ruins – Check for Hotels and Apartment Deals in Zadar. If you’re on a budget – or you simply like to stay in more of a community – then you might book hostels in Croatia. Lots of hostels will have parking but not all of them. It’s important to check the booking site and/or call the hostel if you’re unsure whether you can park your car there. Check out the availability of Croatia hostels on Hostelworld. If you’re planning a road trip around Croatia, you’ll likely find that there are lots of cities, towns, and attractions that you can visit. The amount of top things to do in Croatia is staggering! As for things to do in each place, those can be a little more tricky to figure out. It’s important to do your research beforehand if you’re going to Croatia in the busy summer season from June to September. The best attractions and tours get booked up and it can make impromptu planning a little more tricky. So, to help you out, we’ve included a few ideas of things that you can do while touring around Croatia. We’ve discussed things to do briefly in each of the cities we know best but to help you out, you can also browse the top tours and attractions before you start planning. 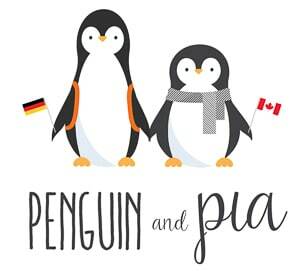 Remember, the summer gets busy – so best to plan and book the things you are absolutely keen on doing if you know your travel dates ahead of time! If you planned on doing a shorter road trip in Croatia, it’d be best to fly into one of the larger centres, rent your car, take yourself to the main sights, and then drop it off and fly out. To do this, there are a few different versions of a 5 day Croatia road trip. You COULD go top to bottom in 5 days but it would be a very rushed trip. In our opinion, you wouldn’t get to take in the sights in the places you stop because you’d be so conscious that you have to hop in the car and drive to the next location. Because of this, we suggest a Northern Croatia itinerary and a Southern Croatia itinerary – both of which are about 5 days long. This route includes more of the scenic national parks and less of the famed Adriatic Coast. It’s about 1,000 km if you hug the coast between Pula and Zadar and about 14 hours of driving time total. There are also tolls on this route. To avoid tolls, you’d take quite a few turns from Zagreb to Pula amd would have to add a little extra driving time. Ah, Zagreb – the perfect place to begin any Croatia road trip. The capital city is also Croatia’s largest, and there is no shortage of things to do and see. What makes the city unique is the fact that it’s NOT on the coast. While many of the coastal towns and cities get all the attention (and for good reason) Zagreb stands as a stunning centre of culture, tucked away – almost hidden – among the nearby bigger cities Europe. Picking up a car in Zagreb would be easy seeing as it’s a huge centre of tourist activity. In general, Day 1 of your Northern Croatia itinerary is very dependent on when you arrive and how. Depending on when you fly or drive in, you will have more or less time in the capital city. In any case, you can do what you like on the first day but we recommend you spend a night in Zagreb if you want to see more of the city that day and the following day as well. Check for apartments and hotels to spend a night in Zagreb. If you have the time, you could consider an optional tag-on trip to Varaždin, which is about an hour drive north of the capital. This Baroque city has a medieval charm with the old town and fortifications to check out. On Day 2, you’ll head for the northwestern coast of Croatia. There are lots of places you could set as your main destination. On the above map, we chose Pula to show you how far the drive could potentially be from Zagreb. The drive from Zagreb to Pula is about 3 hours. However, instead of Pula, you could just as easily drive to Rovinj or Poreč which are within the hour north of Pula on the coast. Pula is the bigger centre that people gravitate to and then use it as a base to visit the other two towns on a day trip. However, you can easily stay in the other two to avoid the crowds – even though Rovinj is still quite popular. Check for your accommodation in Pula or Rovinj or Poreč. If you didn’t want to drive all the way to the far west coast knowing you would see it in Zadar, then you could make your stop to sleep in Rijeka. This lesser-talked about city is actually the third largest in Croatia so it has lots to offer. As a main seaport, the city has been a crossroads for the world of centuries and it shows in the architecture, the history, the layout of the city, and the things to do! If you plan on sleeping in Rijeka, start looking for hotels or apartments in Rijeka. On Day 3, you’ll head for Zadar. Eric visited Zadar on a trip with friends in 2013 and he’s been dying to get back. The drive to Zadar from Pula will take about 5 hours but will be less if you stop and sleep in Rijeka instead. Just remember to hug the coastline for a stunning drive. You’ll pass through tiny seaside towns in which you can choose to stop at or not – time depending! This is a simple day and you’ll have time to explore the city once you get in. You’ll have a short driving day tomorrow so don’t feel guilty for stopping along the coast or getting into Zadar late. You can also explore Zadar the next morning before you head for Krka. To sleep in Zadar, the best places are in the historic centre or on the coast – check out availability in Zadar. You could even choose a hostel – the Mellow Monkey in Zadar made our list of favourite hostels in Europe! Day 4 is going to be a great day if you like exploring waterfalls! Today, you’ll drive to the small town of Skradin, which has one of the main entrances to Krka National Park! The drive to Skradin from Zadar is about an hour so it’s not too long. You can also choose to stop in Šibenik (a nice coastal town/city) on the way to Krka. That said, Krka is a popular spot so it’s best to get there early-ish to catch the ferry from Skradin into the park. If you want to visit Krka National Park – we went and wrote a whole Krka National Park Guide so you understand the entrances, the fees, and other logistics. Krka can be confusing but once you read about the main details it will make more sense. We even made a great little video about exploring Krka! There are actually two main towns/entrances to Krka National Park at the south end of the park. So, you could sleep in the town of Skradin or you can choose to sleep in the more remote Lozovac. Each entrance comes with different pros and cons to accessing Krka so choose the one that works for you. The ferries go from Skradin, however, and that’s what we did. Book a place to stay in historic Skradin or check out Lozovac if you are interested in a more remote experience! On Day 5, it’s time to wrap up your northern road trip. The drive back to Zagreb will take about 4.5 hours if you head straight there from Skradin. That said, if you didn’t have enough nature on this road trip, you could always detour on the way north to Plitviče Lakes National Park. This stop will break the drive roughly in half which can help the driver get a nice break. In the busy season, the Plitviče Park actually closes during the day to alleviate the number of guests so keep this as a side option and not as part of the itinerary unless you’re absolutely dying to go (instead of Krka). You can learn more about visiting Plitviče here. Another consideration for your last day is the time you need to return the car by. Each dealer is going to be different so be sure to read the fine print and adhere to the times for drop-off. This way you make sure you don’t get charged late fees or other unnecessary fees. 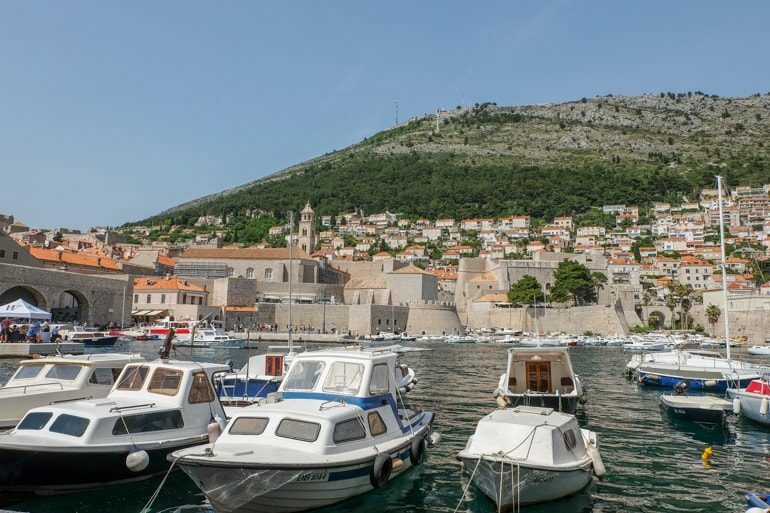 If exploring classic cities like Dubrovnik and islands like Hvar is in your sights, then perhaps a Croatia road trip of the southern portions of the country is for you? This itinerary above is just over 600 kilometres with a total driving time of just over 12 hours. Of course, this is including toll routes so if you want to avoid tolls then you’ll need to adjust the driving time. With this road trip route, there are a few considerations you need to think about. If you drive from Dubrovnik towards Split, you will cross through Bosnia and Herzegovina for about 15 minutes even though you stay on the same road. Because it’s a formal crossing in and then out of Bosnia, you’ll need your passport or ID card handy for inspection. We did this exact crossing a few times in the span of a few weeks and wrote a whole post on our experience at this Croatia-Bosnia border crossing when we travelled from Dubrovnik to Split on a larger bus trip! This itinerary also takes you to the island of Hvar. To get there, you’ll need to consider the ferry schedules. We’ll dive into the logistics of the ferry down below. 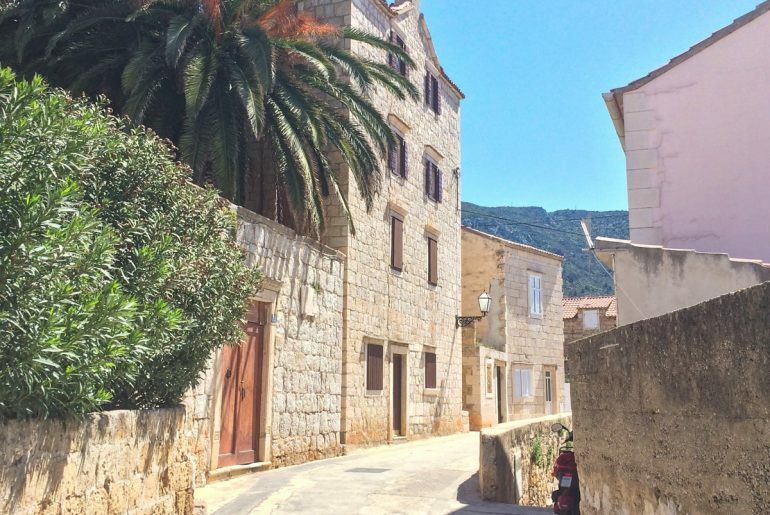 If you want to drive this route in the off-season or on the days that the ferries run don’t line up with your timeline, then you can simply make Hvar a day trip from Split or skip the islands all together and hug the coast to drive back down to Dubrovnik. There are plenty of beautiful towns to stay in/stop in to fill the time. You’ll begin this itinerary in the south of the country in the popular city of Dubrovnik. You can read all about things to do in Dubrovnik here. The bottom of the country is a busy spot, but it means that the car rental industry is well-developed. This allows you to shop around for the best deal if you have the time. If you’re flying in, pick up your car from Dubrovnik airport, perhaps settle into your apartment or hotel, and then take the day to explore the city. Since you’ll be sleeping in Dubrovnik, you can read our guide on the best places to stay in Dubrovnik or just go ahead and check for the best accommodations in Dubrovnik. For Day 2, you’ll wake up early and hop in the car. Drive up the coast towards Makarska. The drive is about 2.5 hours so not too long for a scenic day drive up the coast. Keep in mind, you will be crossing into Bosnia and Herzegovina at the coastal town of Neum so be sure to have your passports ready. Depending on the season, this crossing might be very quick or you might be waiting for a few hours. 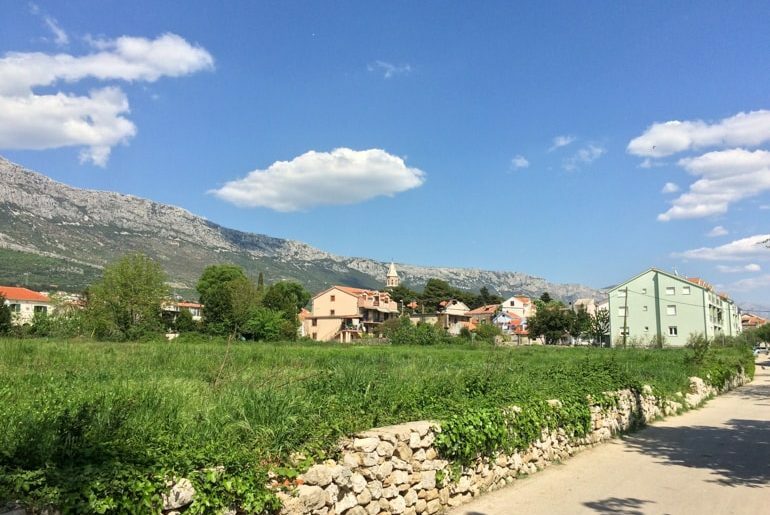 The earlier you wake up, the earlier you are to beat the tour buses to the border as they head for places in the north of Croatia – like Split, Zadar, Zagreb, etc. 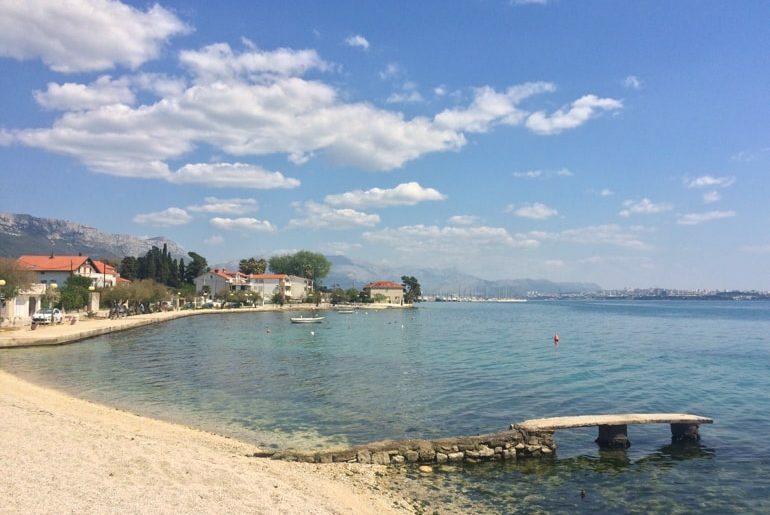 Get into Makarska, park the car at your accommodation, and go explore the seaside town. Since you’ll be sleeping in Makarska, you’ll likely find an apartment rather than a hotel. Luckily, the industry is well-developed here. Check for a great apartment in Mararska here. Good morning! Today, you’re going to Split. 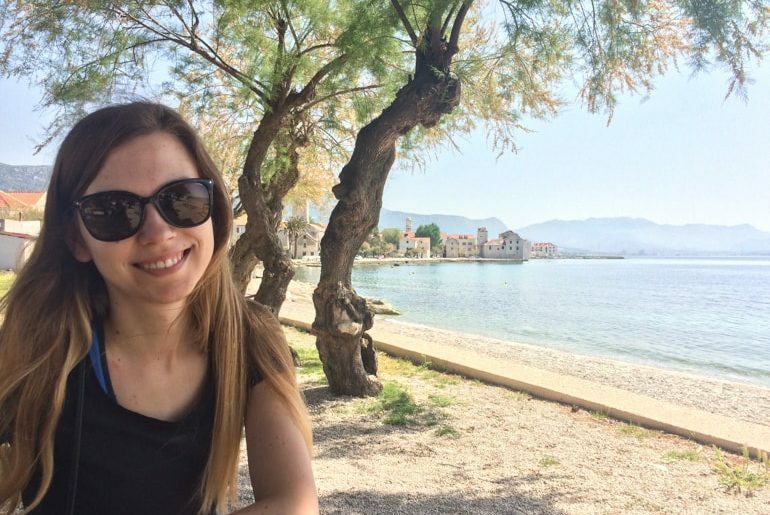 We lived outside of Split for a few weeks in early 2018 and loved every second of it. The drive to Split from Makarska is about 1.5 hours if you hug the coast and drive through Omiš. Speaking of Omiš, this seaside town makes a great stop-in to break up the day drive. That said, don’t spend too much time here because you’ll need to get into Split to be able to explore it to the max! 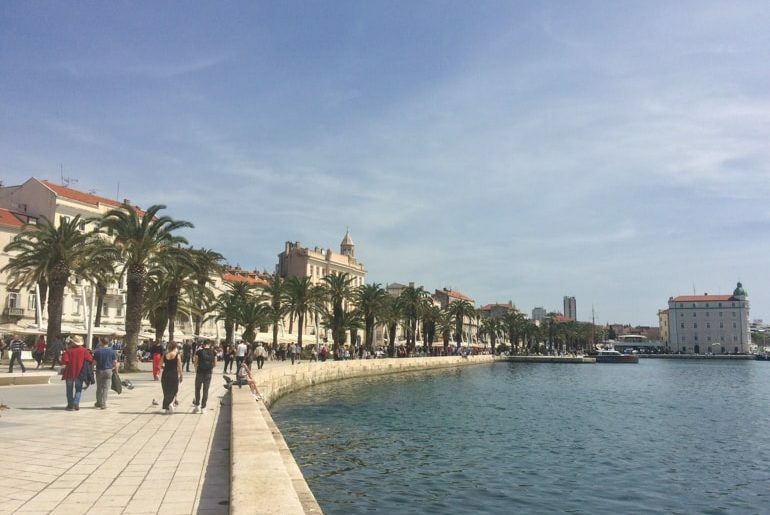 Split has so much to offer – from the stunning old town to serving as a gateway to island hopping adventures. 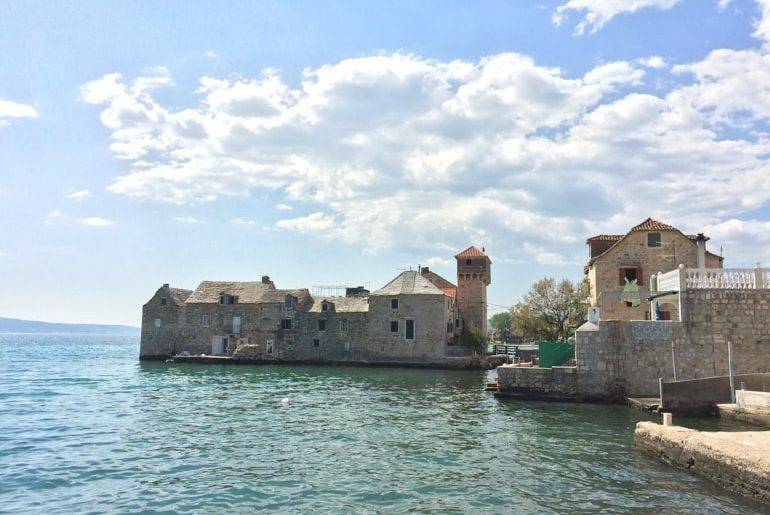 There are also lots of great day trips from Split which we cover in another post if you are interested in modifying the itinerary to suit your needs! For this itinerary, we’d suggest sleeping in Split and booking the accommodation for two nights. It’ll make the rest of the itinerary easy to execute. Check for the best deals on hotels and apartments in Split here. If you want to see the beautiful Split Old Town, you can watch our video on our YouTube Channel here. On Day 4, you’re going to drive to Skradin from Split to where you can enter and explore Krka National Park. The drive (depending on Split morning traffic and where you stay) can take anywhere from 1-2 hours. 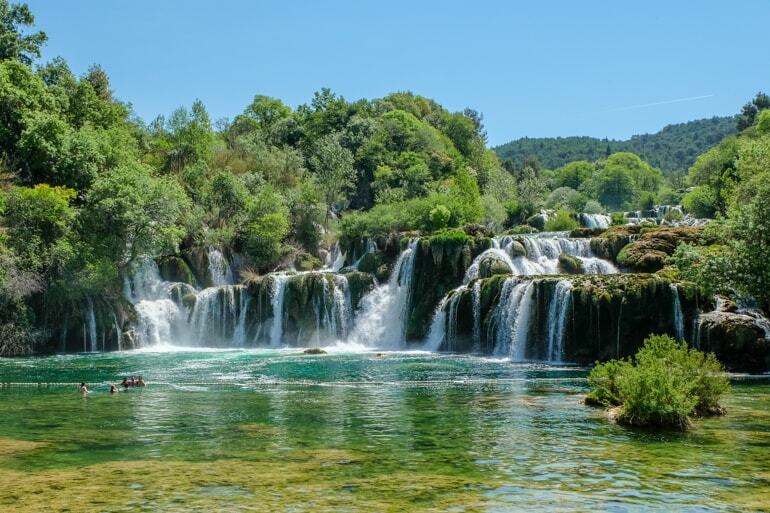 We’ve covered this in the above itinerary but, again, if you want to visit Krka National Park – here is our Krka National Park Guide that has all the essential information you’ll need to visit. The difference in this itinerary from the one above is that instead of sleeping close to Krka National Park, you’ll return to Split because the next morning you’ll hop onto the ferry to Hvar from Split. Once again, here’s where to look for places to stay in Split. On Day 5, you’re going to head to the famous island of Hvar. For this itinerary, you slept in Split and so you can take an early ferry from Split with your car. This ferry schedule for Split to Hvar with a car is here – with the journey taking about 2 hours to Stari Grad on Hvar. In the summer, there are more frequent ferries but in the off-season getting to Hvar can be trickier. If you are taking a car, it’s recommended to be there 1-2 hours early to load the car given the other traffic that needs to get to the island as well. There is a chance you don’t get on the ferry if you don’t book ahead or if you aren’t there early enough with your car. It’s also important to consider the price of a ferry ticket with your car. These two ferry crossings are among the few in Croatia that allow for cars. Many of the other island hoppers on catamarans are “foot traffic” only. Either way, the trip is worth it. Hvar is a very cool island to explore and having a car makes it easy to discover lots of different places that the buses simply don’t reach. Check out our guide on the best things to do in Hvar. You can also rent a car ON the island but you’ll need to ditch your old car (or just leave it in Split and grab it again if you want to come back to Split?). We suggest you spend the night on Hvar so you don’t have to worry about the ferry crossing twice in one day. Check here for accommodation deals on the island of Hvar. Alternatively, if you want to leave the island hopping for its own day trip and leave the car in Split, you might consider an island hopping tour that takes you to 5 islands (including Hvar). Read about our Croatia Island Hopping day trip because it was an absolute blast of a day and well worth the money! On the last day, you’ll return to Dubrovnik. There are a few ways you can do this depending on how you got to Hvar and what you took with you. If you took the car on the ferry, then you can drive the length of the island (1.5 hours) and leave the island via the Sucuraj-Drvenik Ferry. The ferry schedule for Sucuraj to Drvenik (with a car) is here. From Drvenik, the drive back to Dubrovnik would be just over 2 hours and you’ll cross through Bosnia again on the highway. If you did a day trip to Hvar (or skipped Hvar altogether) and you are leaving for Dubrovnik from Split, then the drive is about 3.5 hours down the highway you came up. Our version of a 7 day Croatia Road Trip would be a mix of both itineraries above. With one week to drive around, you could very well drive the length of the country to see the best spots and still have the time to see smaller gems along the way. For this road trip, the total distance is about 1000 kilometers with a total driving time of about 14 hours. This is similar to the northern Croatia road trip itinerary we presented except that one is a loop from Zagreb. Isn’t it crazy – you can cover the length of the country in basically the same time/distance! Of course, these are rough estimates. The actual time is dependent on traffic in the centres you pass through, border crossings into and out of Bosnia and Herzegovina (which we covered above), and a variety of other factors. You’ll notice that this itinerary takes you from bottom to top of the country but you could easily reverse the order. Since it doesn’t take you onto any islands, there are no ferry schedules to worry about. This route as planned also includes tolls but you can avoid them. If you do so, you’ll end up on smaller roads and not the major routes. While this is generally safe for travel, it’s a good idea to have (or rent) a GPS so that you don’t end up getting turned around and lost in the Croatian countryside! The beginning of this itinerary is the same as the “5 Day Southern Trip” outlined above. Start in Dubrovnik and drive to Makarska. Remember the border crossing through Bosnia. 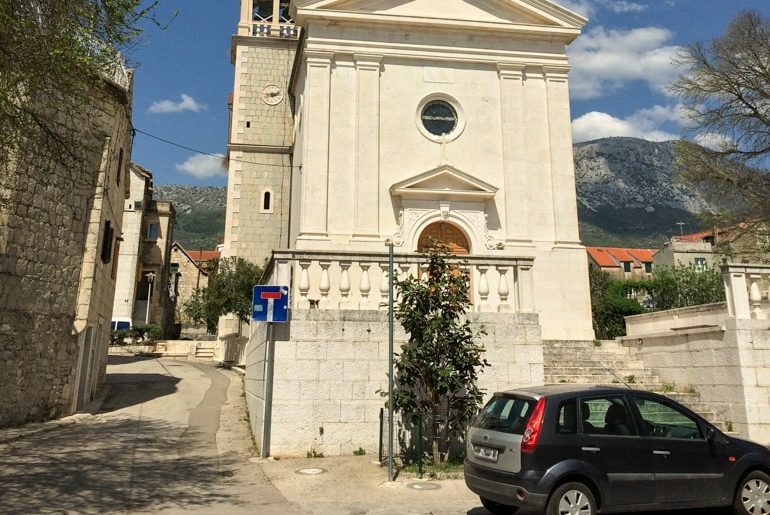 Then drive from Makarska to Split – stopping in Omiš on the way. If this is how you want to start your 7-day itinerary around Croatia, then you can get started looking for accommodation in Dubrovnik, Makarska, and Split. On Day 4 and 5, you’ll drive from Split to Krka National Park. We discussed Krka National Park in length above in the “5 Day Northern Trip” itinerary above in this post. The drive takes between 1 and 2 hours. For this itinerary, we suggest sleeping in Skradin as opposed to returning to Split. This is because you will be heading to Zadar after Krka which is continuing up the coast in a northern direction. 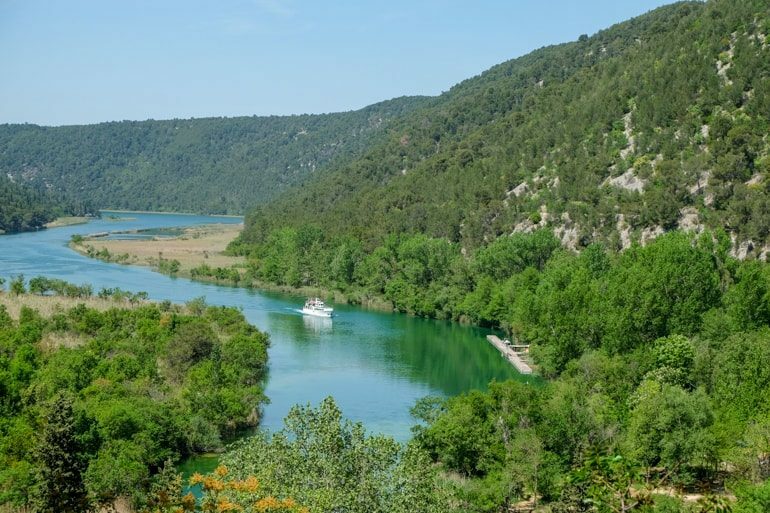 However, since the drive from Split to Krka/Skradin is only like an hour, you don’t HAVE to sleep in Skradin – just a suggestion. Sleeping in Skradin allows you to see more of the park later into the day since you don’t have to drive home as far! Book a place to stay in historic Skradin close to Krka. For Day 5, you’ll drive to Zadar up the coast from Krka, as we mentioned. This drive takes about an hour. We’ve discussed Zadar in the Northern itinerary above so consider spending your night in Zadar. Lisa is all smiles when we’re on the road. Seriously. On Day 6, you’ll head up from Zadar to any of the following places: Pula, Rovinj, or Poreč on the coast, and Rijeka tucked away more inland. The map for this itinerary has “F” as Pula but it is more to show the general location of this leg of the journey. We’ve covered all of these locations in brief in the above itineraries. The drive from Zadar to Pula is about 5 hours but is reduced if you stop in Rijeka instead. Check for your accommodation in Pula or Rovinj or Poreč and if you’re thinking Rijeka, check for hotels and apartments in Rijeka. On the last day, you’ll finish up your week long Croatia road trip in Zagreb. The drive from Pula is about 3 hours but less if you stayed in Rijeka. We cover Zagreb in the top itinerary on “Northern Croatia – 5 Days” itinerary but if you nee to stay over in Zagreb, check for apartments and hotels to spend a night in Zagreb. That concludes our epic itinerary for a 7 day Croatia road trip. As we mentioned, you can reverse the order if you want to start in Zagreb. Feel free to swap out cities and towns for ones that you want to check out. This is only to serve as a driving guide to show you distances and help you plan! That said, you COULD travel this as is – if you do, let us know! Here it is. The big one. The epic road trip. If you wanted a two week Croatia road trip, this could be the itinerary for you. 14 days to drive around Croatia is quite a while but you would certainly see a great deal of this awesome country. This road trip would be a beast. As planned above with the scheduled day trips you’d cover around 1300 kilometres. The driving time would be around 20 hours – but of course, this varies by traffic, border crossings, ferry crossings, which day trips you opt to take, etc. You should also consider the price of renting a car for two weeks to see if there are any companies that offer discounts! Depending on the ferry schedule and season, you could cut the two nights in Hvar and stick to the mainland coast, doubling a night in any one of the following places: Dubrovnik, Omiš, Šibenik or Rijeka. Alternatively, you could also add on Varaždīn at the end. To make this modification, you would just go from Dubrovnik to Split through Makarska and add on things to see/places to stop in the north of the country. Alternatively, you could just slow the pace to see another national park like Plitviče (you’d get to it from Zadar or Rijeka). Like we’ve mentioned in the above itineraries, start in Dubrovnik and drive to Makarska on Day 2. 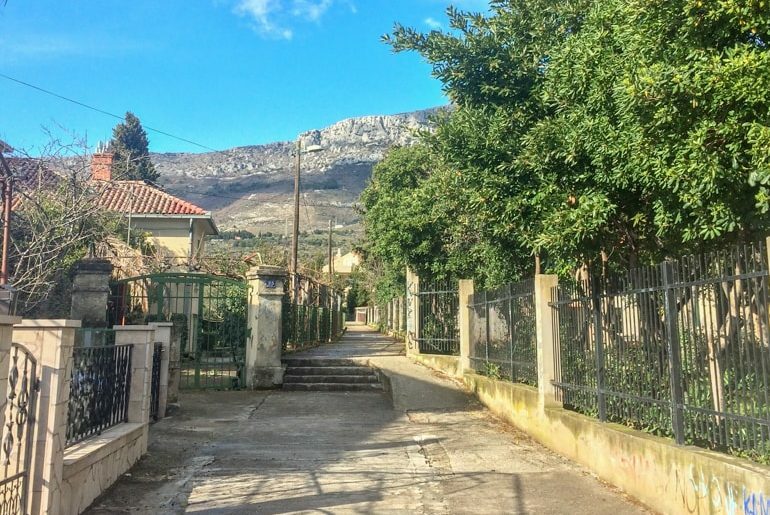 The key here is that you don’t extend the drive to Omiš – you’ll see Omiš later on this trip. The drive from Dubrovnik to Makarska is 2.5 hours. Get started looking for accommodation in Dubrovnik and Makarska. You’ll have to take the Sucuraj-Drvenik Ferry we discussed in the 7 Day itinerary. You’ll explore Hvar Town and sleep in Hvar Town this evening. The drive from the ferry crossing to Hvar Town on Hvar is about 1.5 hours – or the length of the island of Hvar, basically. 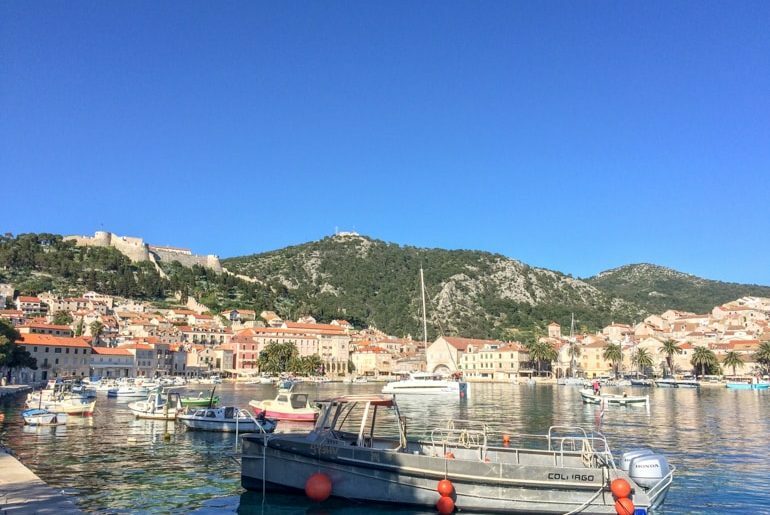 On Day 4, you’ll explore Hvar but move to Stari Grad and sleep in Stari Grad to catch the ferry the next day. You can’t get the ferry from Hvar Town. Check here for accommodation deals on the island of Hvar. On Day 5, you’ll take the ferry from Hvar to Split and sleep in Split for two nights. This is because you’ll use it as a base to do a day trip on Day 6 to Omiš. The drive from Split to Omiš about an hour one-way. Check for the best deals on hotels and apartments in Split here. On Day 7, you’ll explore the area outside of Split as you head up the coast towards Zadar and Krka. Kaštela is one town made up of seven small seaside villages that were created centuries ago and remain to this day. Located about 30 minutes outside of Split, they are a great getaway from the busy city. As small fortified fishing villages, there is a ton of history packed away in these small towns. 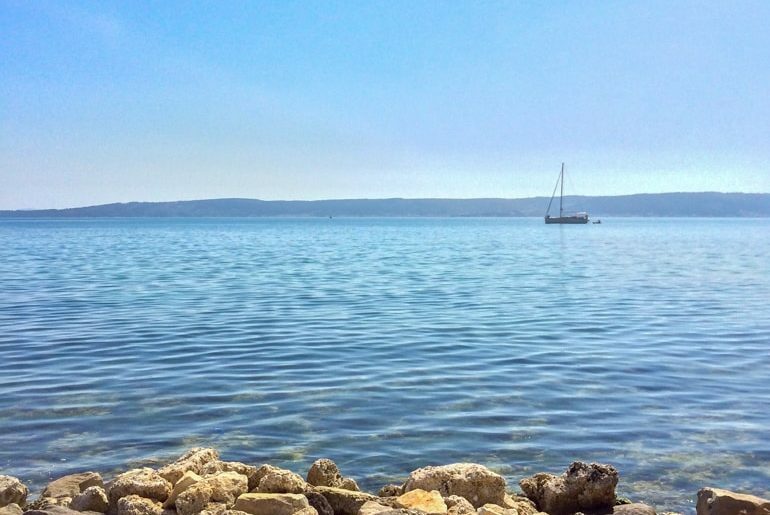 We stayed in Kaštel Kambelovac for a few weeks and we think you should stay in one of the Kaštelas as well! Search for apartment deals in the seaside Kaštelas outside of Split. You can use this place as a base for two nights if you so choose! 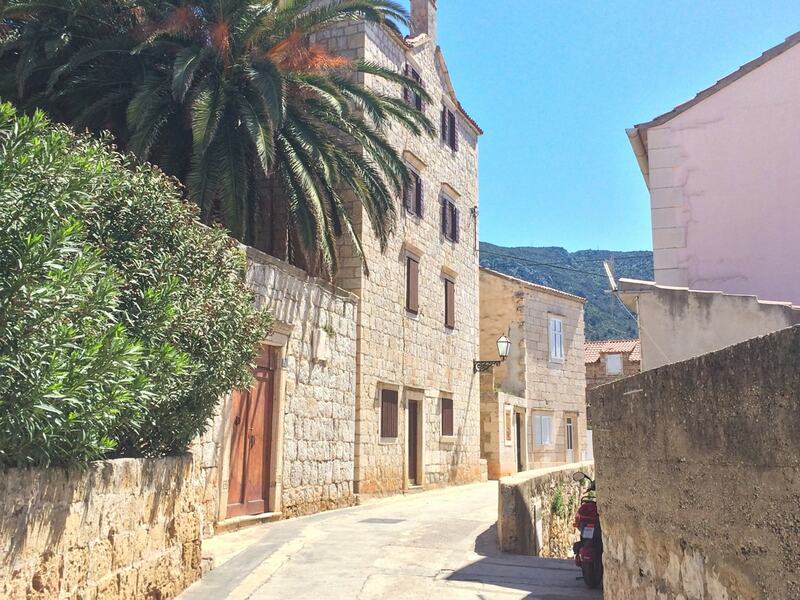 On Day 8, you can take a day trip to thew historic town of Trogir. Trogir is known for its medieval old town that sits on its own island and was a strategic point in Croatia’s defense and trading many, many years ago. Today, the rich history draws visitors in huge numbers and it’s worth checking out! We suggest sleeping in your place in the Kaštelas since you have the car and it’s very close. However, since you are heading to Krka after Trogir and you’d be backtracking to go back to your base you COULD sleep in Trogir since it’s very popular and there are SO many places to book. 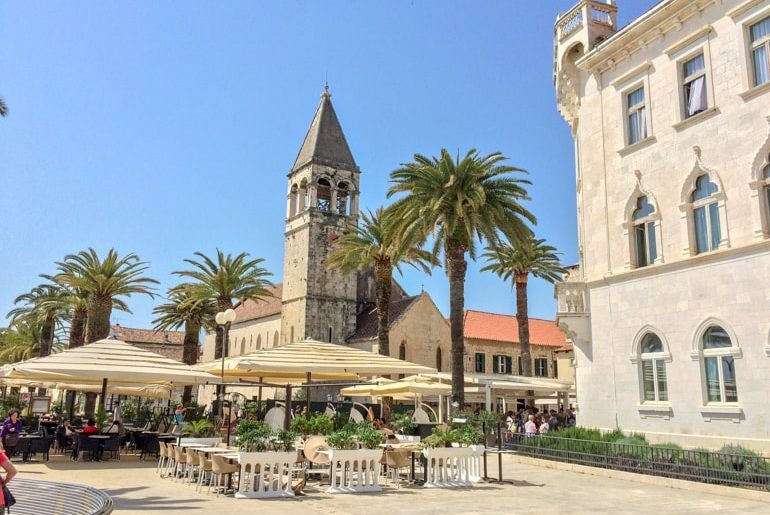 Search for deals in the historic centre of Trogir. On Day 9, head to Krka National Park – which we have covered in detail in the above itineraries. The drive from Split would be about 1.5 hours and slightly shorter from the Kaštela or Trogir since you’re already outside the busy city centre traffic. We suggest sleeping in Skradin since you’ll be continuing up the coast. Book a place to stay in historic Skradin close to Krka! On Day 10, you’l drive from Skradin to Šibenik. This is a very short drive (20 minutes) so you’ll have loads of time to explore the two places. Alternatively, you can keep your base in Skradin and make Šibenik a day trip. However, since you’ll head to Zadar tomorrow changing your sleeping base to somewhere on the highway/coast would be worth it. So, if you want to sleep in Šibenik, search for deals in Šibenik on the coast! On Day 11, head for Zadar up the coast from Šibenik about 1.5 hours. The next few days are pretty simple and we’ve covered them above but we’ll do it again if this is the first time you’re reading this itinerary. Check out available hotels and apartments in Zadar. Day 12 takes you to Pula from Zadar, a drive of about 5 hours along the coast. Day 13 takes you from Pula to Rovinj or Poreč. The drive would be very short – about 40 minutes to an hour if you go to Poreč. Depending on what you want to see, you can choose to stay in one of these coatsl places and day trip to the other, or just choose one and make it easy. Check for your accommodation in Pula and Rovinj or Poreč. Finally, on Day 14, you’ll drive from the coast (wherever you stopped) to Zagreb. The drive is about 3 hours from those locations but will vary depending on traffic and other factors. If you need to drop off the car, remember to be mindful of the drop-off hours so you don’t get fined or charged extra! Staying in Zagreb? Check for apartments and hotels to spend a night in Zagreb. And there you have it – some of the best put together Croatia road trip itineraries out there! Obviously, these can be travelled as is or modified how you like. We just tried to give you the baseline knowledge to put together the road trip of your dreams. We loved Croatia and look forward to exploring even more of it with a car. Don’t forget to make arrangments for your rental car before you start your adventure! Even though we spent a few weeks there and mainly used the buses to get around, we know there is so much more to discover! Have you road tripped around Croatia? What do you think of these itineraries? Get in touch and let us know if you end up travelling one of them! We’ve love to hear it!